Showtime Sports head Stephen Espinoza is not confident that Floyd Mayweather vs. Conor McGregor will break the pay-per-view buy record. The current record holder is Mayweather vs. Manny Pacquiao - which generated 4.6 million buys back in 2015. The contest had between six and seven years of hype before the boxers stepped in the ring to face each other. Mayweather (49-0, 26 KOs) will face McGregor on Saturday night at the T-Mobile Arena in Las Vegas. Their contest had less than two years of hype, but worldwide media attention is surpassed what Mayweather-Pacquiao was receiving two years ago. The pay-per-view buyrate figure is going to be high, but how high is the question. While Espinoza says the possibility is there, the likelihood of breaking the pay-per-view record is up in the air. “I am definitely on the fence. I do not believe it will, just because I never believe that it’s going to be, I’m just conservative by nature. Do we have the potential? Absolutely,” Espinoza said to MMA Fighting. 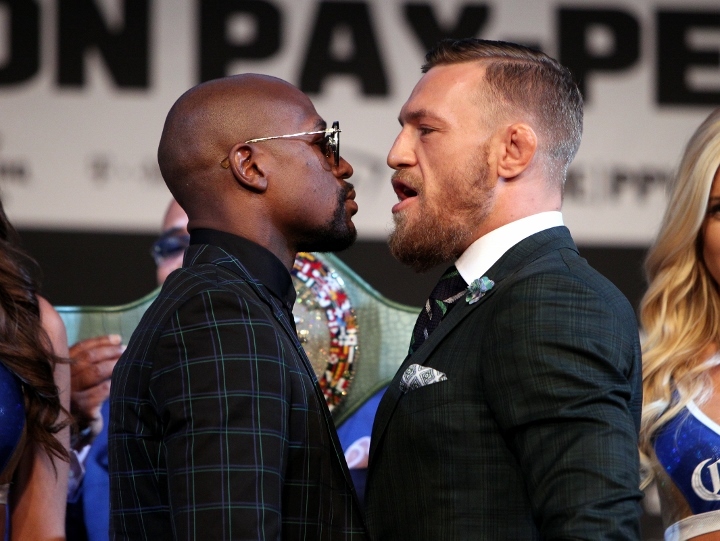 Since the fight between undefeated boxer Mayweather and mixed martial arts champion McGregor was announced in June, the two men took part in a profanity laced world tour to hype a bout that has been met with both scepticism and excitement. The final press conference ahead of Saturday's fight, however, was closer to a love-in than a battle field with Mayweather, in particular, complimenting the man who has questioned everything from his manhood to his fashion sense. "Conor McGregor had a hell of a career, he's still got a hell of a career," said Mayweather. "He's a hell of a fighter, he's a stand up guy, a tough competitor. "It's not going to be an easy fight. There will be blood sweat and tears Saturday." McGregor was far less effusive in his compliments but after months of mercilessly attacking Mayweather said he welcomed the pause in hostilities. "There's been a lot of crazy press conferences, this is a lot more subdued, a lot more business like the way I like it ... sometimes," said McGregor. The restrained tone of Wednesday's media conference underscored the high stakes of what is expected to be the richest fight in boxing with McGregor in line for $100 million payday and Mayweather as much as $200 million. While boxing purists and pundits have denounced the fight as nothing more than a laughable cash grab it has nonetheless captured the fascination of fans.